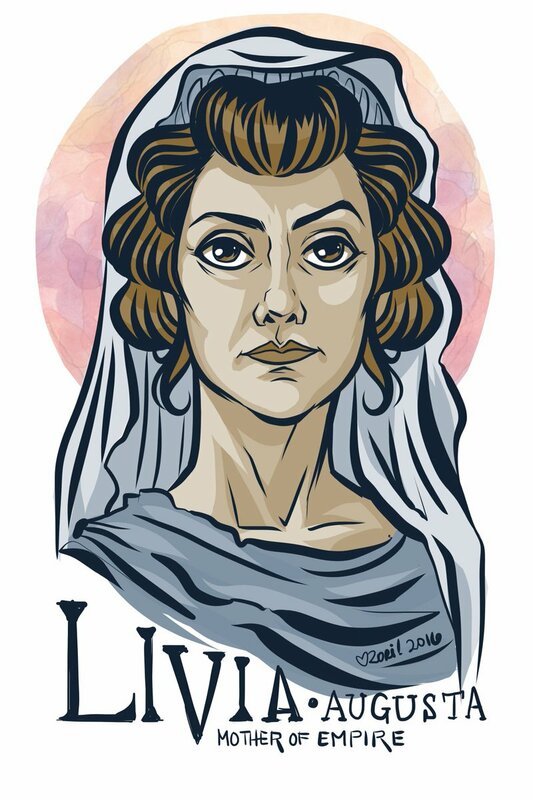 Today is the (sometimes disputed) birthday (58 BCE) of Livia Drusilla, also known as Julia Augusta after her formal adoption into the Julian family in 14 CE, wife of the Roman emperor Augustus throughout his reign, as well as his political adviser. 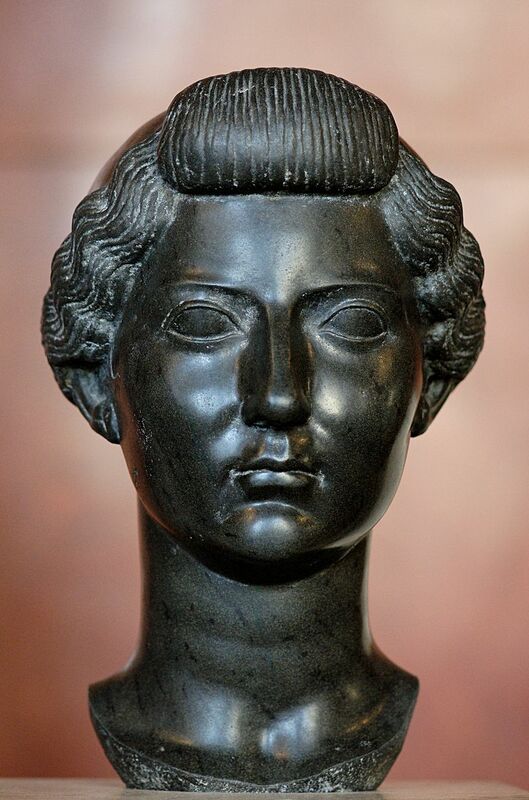 She was the mother of the emperor Tiberius, paternal grandmother of the emperor Claudius, paternal great-grandmother of the emperor Caligula, and maternal great-great-grandmother of the emperor Nero. She was deified by Claudius who acknowledged her title of Augusta. In modern historical fiction she is usually portrayed as a Machiavellian presence throughout the early empire, but more analytic historians paint her as a strong woman in a time when men controlled politics. She was the daughter of Marcus Livius Drusus Claudianus and his wife Aufidia, a daughter of the magistrate Marcus Aufidius Lurco. The diminutive Drusilla, commonly used in her name, suggests that she was a second daughter. She was probably first married in 43 BCE. Her father married her to Tiberius Claudius Nero, her cousin of patrician status who was fighting with him on the side of Julius Caesar’s assassins against Octavian (later the emperor Augustus). Her father committed suicide in the Battle of Philippi, along with Gaius Cassius Longinus and Marcus Junius Brutus, but her husband continued fighting against Octavian, now on behalf of Mark Antony and his brother Lucius Antonius. Her first child, the future Emperor Tiberius, was born in 42 BCE. In 40 BCE the family was forced to flee Italy in order to avoid the Triumvirate of Octavian, Marcus Aemilius Lepidus, and Mark Antony and the proscriptions they began. They joined with a son of Pompey Magnus, Sextus Pompeius, who was fighting the triumvirate from his base in Sicily. Later, Livia, her husband Tiberius Nero, and their two-year-old son, Tiberius, moved on to Greece. After peace was established between the Triumvirate and the followers of Sextus Pompeius, a general amnesty was announced, and Livia returned to Rome, where she was personally introduced to Octavian in 39 BCE. At this time, was pregnant with a second son, Nero Claudius Drusus (also known as Drusus the Elder). Legend has it that Octavian fell immediately in love with her, despite the fact that he was still married to Scribonia. Octavian divorced Scribonia in 39 BCE, on the very day that she gave birth to his daughter Julia the Elder. Seemingly around that time, when Livia was six months pregnant, Tiberius Claudius Nero was persuaded or forced by Octavian to divorce Livia. On 14 January, the child was born. Augustus and Livia married on 17 January, waiving the traditional waiting period. Tiberius Claudius Nero was present at the wedding, giving her in marriage “just as a father would.” The importance of the patrician Claudii to Octavian’s cause, and the political survival of the Claudii Nerones are probably more rational explanations for the speedy union. Nevertheless, Livia and Augustus remained married for the next 51 years, despite the fact that they had no children apart from a single miscarriage. She always enjoyed the status of privileged counselor to her husband, petitioning him on the behalf of others and influencing his policies, an unusual role for a Roman wife in a culture dominated by the pater familias. After Mark Antony’s suicide following the Battle of Actium in 31 BC, Octavian returned to Rome triumphant. On 16 January 27 BCE, the Senate bestowed upon him the honorary title of Augustus (“honorable” or “revered one”). Augustus rejected monarchical titles, instead choosing to refer to himself as Princeps Civitatis (“First Citizen of the State”) or Princeps Senatus (“First among the Senate”). He and Livia formed the role model for Roman households. Despite their wealth and power, Augustus’ family continued to live modestly in their house on the Palatine Hill. 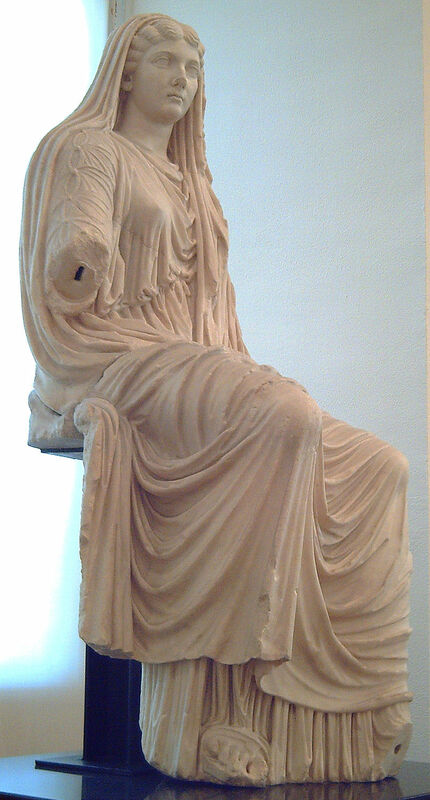 Livia would set the pattern for the noble Roman matrona. She wore neither excessive jewelry nor pretentious costumes, she took care of the household and her husband (often making his clothes herself), always faithful and dedicated. 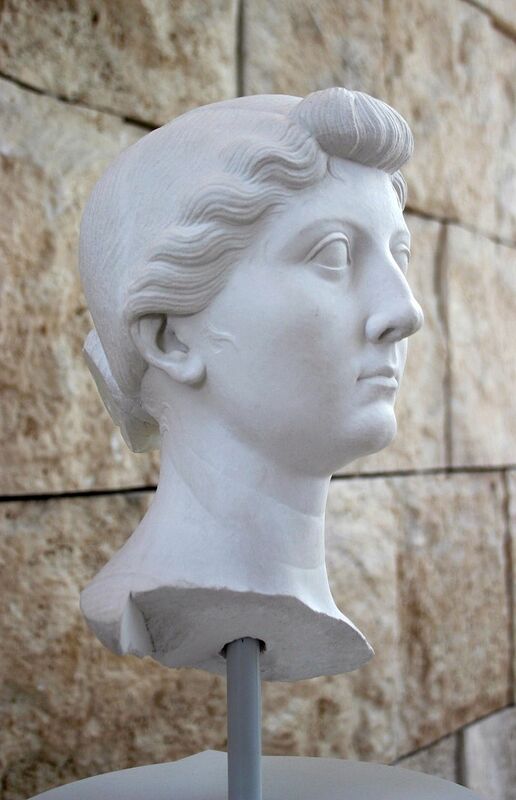 In 35 BCE Octavian gave Livia the unprecedented honor of ruling her own finances and dedicated a public statue to her. She had her own circle of clients and pushed many protégés into political offices, including the grandfathers of the later emperors Galba and Otho. With Augustus being the father of only one daughter, Livia soon started to push her own sons, Tiberius and Nero Claudius Drusus, into power. Drusus was a trusted general and married Augustus’ favorite niece, Antonia Minor. They had three children including the future emperor Claudiua. Tiberius married Augustus’ daughter Julia the Elder in 11 BCE and was ultimately adopted by his stepfather in 4CE and named as Augustus’ heir. Rumor had it that when Marcellus, nephew of Augustus, died in 23 BCE, it was no natural death, and that Livia was behind it. After the two elder sons of Julia by Marcus Vipsanius Agrippa, whom Augustus had adopted as sons and successors, had died, he adopted the one remaining son Agrippa Postumus at the same time as Tiberius, but later Agrippa Postumus was sent to an island and finally killed. Tacitus charges that Livia was not altogether innocent of these deaths and Cassius Dio also mentions such rumors. There are also rumors mentioned by Tacitus and Cassius Dio that Livia brought about Augustus’ death by poisoning fresh figs. Augustus’ granddaughter was Julia the Younger. Some time between 1 CE and 14 CE, her husband Lucius Aemilius Paullus was executed as a conspirator in a revolt. Modern historians theorize that Julia’s exile was not actually for adultery but for involvement in Paullus’ revolt. Livia Drusilla plotted against her stepdaughter’s family and ruined them. This led to open compassion for the fallen family. Julia died in 29 AD on the same island where she had been sent in exile twenty years earlier. Augustus died on August 19, 14 CE, being deified by the Senate shortly afterwards. In his will, he left one third of his property to Livia, and the other two thirds to Tiberius. In the will, he also adopted her into the Julian family and granted her the honorific title of Augusta. These dispositions permitted Livia to maintain her status and power after her husband’s death, under the new name of Julia Augusta. Tacitus and Cassius Dio wrote that rumors persisted that Augustus was poisoned by Livia, but these are mainly dismissed as malicious fabrications spread by political enemies of the dynasty. The historians Tacitus and Cassius Dio depict an overweening, even domineering dowager, ready to interfere in Tiberius’ decisions, the most notable instances being the case of Urgulania (grandmother of Claudius’s first wife Plautia Urgulanilla), a woman who correctly assumed that her friendship with the empress placed her above the law, and Munatia Plancina, suspected of murdering Germanicus and saved at Livia’s entreaty. (Plancina committed suicide in AD 33 after being accused again of murder after Livia’s death). A notice from 22 CE records that Julia Augusta (Livia) dedicated a statue to Augustus in the center of Rome, placing her own name even before that of Tiberius. Ancient historians give as a reason for Tiberius’ retirement to Capri his inability to endure her any longer. 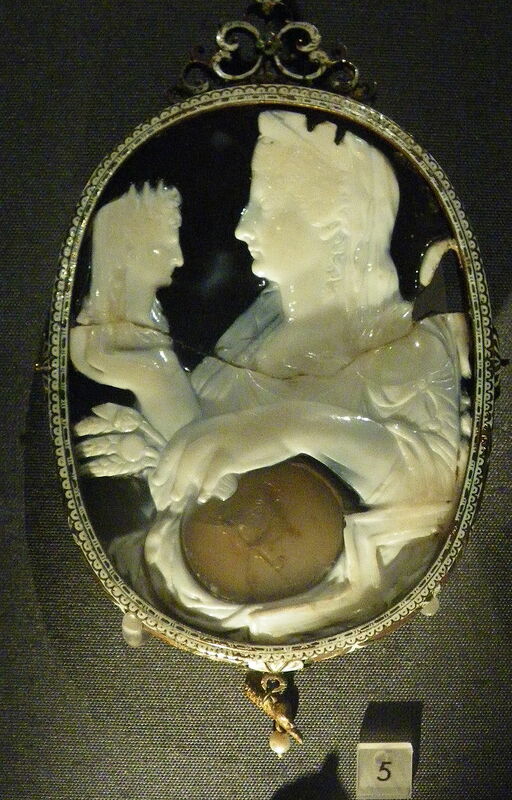 Until 22 CE there had, according to Tacitus, been “a genuine harmony between mother and son, or a hatred well concealed.” Dio tells us that at the time of his accession Tiberius already heartily loathed her. In 22 CE she had fallen ill, and Tiberius had hastened back to Rome in order to be with her. But in 29 CE when she finally fell ill and died, he remained on Capri, pleading pressure of work and sending Caligula to deliver the funeral oration. Suetonius adds the macabre detail that “when she died… after a delay of several days, during which he held out hope of his coming, [she was at last] buried because the condition of the corpse made it necessary…”. Tiberius also vetoed divine honors for her and later he vetoed all the honors the Senate had granted her after her death and cancelled the fulfillment of her will. It was not until 13 years later, in 42 CE during the reign of her grandson Claudius, that all her honors were restored and her deification finally completed. She was named Diva Augusta (The Divine Augusta), and an elephant-drawn chariot conveyed her image to all public games. 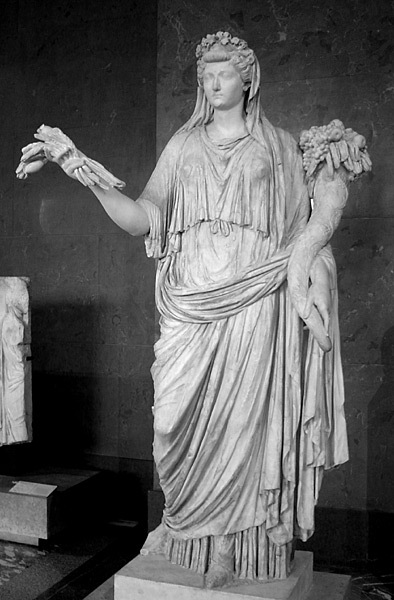 A statue of her was set up in the Temple of Augustus along with her husband’s, races were held in her honor, and women were to invoke her name in their sacred oaths. In 410, during the Sack of Rome, her ashes were scattered when Augustus’ tomb was sacked. 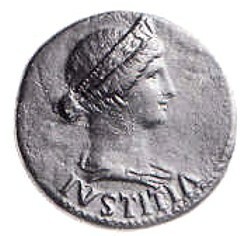 Livia’s image appears in ancient visual media such as coins and portraits. 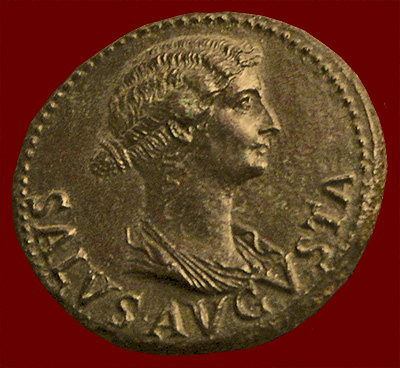 She was the first woman to appear on provincial coins in 16 BCE and her portrait images can be chronologically identified partially from the progression of her hair designs, which represented more than keeping up with the fashions of the time as her depiction with such contemporary details translated into a political statement of representing the ideal Roman woman. Livia’s image evolves with different styles of portraiture that trace her effect on imperial propaganda that helped bridge the gap between her role as wife to the emperor Augustus, to mother of the emperor Tiberius. Becoming more than the “beautiful woman” she is described as in ancient texts, Livia serves as a public image for the idealization of Roman feminine qualities, a motherly figure, and eventually a goddesslike representation that alludes to her virtue. Livia’s power in symbolizing the renewal of the Republic with the female virtues Pietas and Concordia in public displays had a dramatic effect on the visual representation of future imperial women as ideal, honorable mothers and wives of Rome. 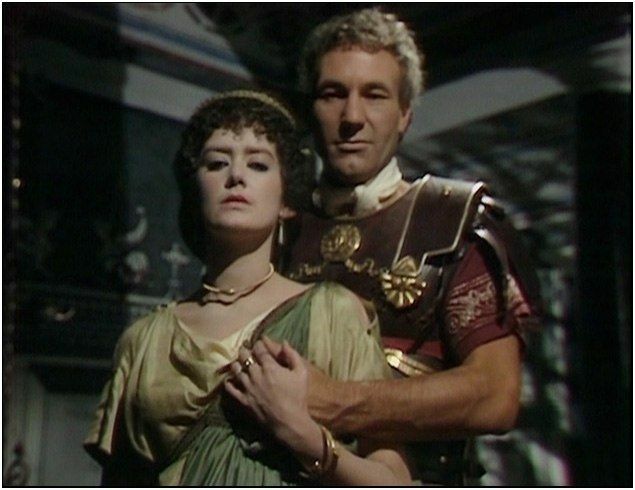 In the popular fictional work I, Claudius by Robert Graves—based on Tacitus’ innuendo—Livia is portrayed as a thoroughly Machiavellian, scheming political mastermind. Determined never to allow republican governance to flower again, as she felt they led to corruption and civil war, and devoted to bringing Tiberius to power and then maintaining him there, she is involved in nearly every death or disgrace in the Julio-Claudian family up to the time of her death. On her deathbed she only fears divine punishment for all she had done, and secures the promise of future deification by her grandson Claudius, an act which, she believes, will guarantee her a blissful afterlife. However, this portrait of her is balanced by her intense devotion to the well-being of the Empire as a whole, and her machinations are justified as a necessarily cruel means to what she firmly considers a noble aspiration: the common good of the Romans, achievable only under strict imperial rule. I suppose Graves’s portrayal is reasonably balanced, but it leaves out some important considerations. First, even if she carried out the nasty things she is accused of, she is no worse than most of the men who held power in Rome. Standard procedure for getting rid of enemies (real or imagined – including family members) was to have them killed, and there were many emperors who killed far more than she. Second, she was a woman in a man’s world. No woman before her had risen to her status before her, and she achieved this by strength of character alone. She had no right to be anything other than a subservient wife, yet she managed to become one of the most powerful people in imperial Rome (male or female). In popular tradition Livia is assumed to be the killer of Augustus using poisoned figs, based largely on the account by Tacitus. There is no way of telling any more, but if she did serve him figs that were poisoned then they would have had to have been spiced, preserved fresh figs to mask the taste of the poison. Apicius in his De re coquinaria (On the Subject of Cooking) has a rather rudimentary recipe for preserved figs, but a little interpolation from the previous recipe can help flesh it out. Select them all very carefully with the stems on and place them in honey so they do not touch each other. 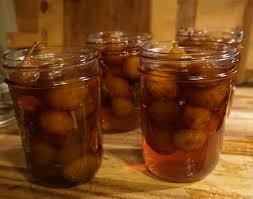 Not removing the stems keeps the fruit intact so that air will not get inside the fruit and start fermentation. The preceding recipe calls for placing fruit in a vessel, and pouring over it honey and defretum. Defretum was new wine that had been spiced and then boiled down to half its volume. 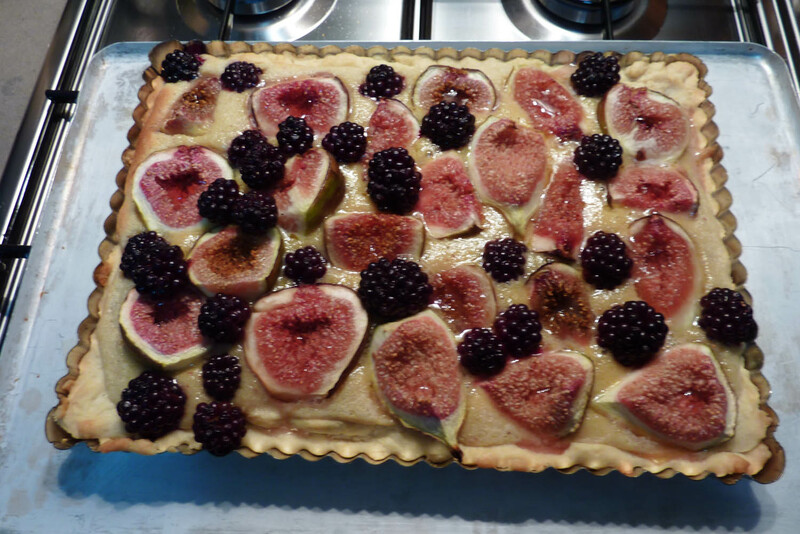 If you can get fresh figs, you have a whole range of options. You can slice them in half and back them in a pie shell. In northern Italy I was very fond of a sandwich made of sliced figs and Gorgonzola. All delicious, but hold off on the arsenic. Today marks the beginning of the Halcyon Days in classical Greek culture: 14 days around the winter solstice of calm winds and pleasant weather. In Greek legend, the name “Halcyon” was associated with Alcyone or Alkyone (Ἁλκυόνη, (Halkyónē), derived from ʼαλκυων (alkyon) “kingfisher”) the daughter of Aeolus, god of the winds. In classical Greek poetry there is an origin tale answering the question, “Where do kingfishers come from, and why is there calm weather around the winter solstice?” I don’t believe that ancient Greeks actually accepted the answer at face value, but it’s a good story. Ovid’s recounting of the tale in Metamorphoses Book XI ll. 410 – 795 (in translation) can be found here, https://web.archive.org/web/20050419213419/http://www.tkline.freeserve.co.uk/Metamorph11.htm#_Toc64105704 There are multiple versions of the tale, but Ovid’s is the fullest. 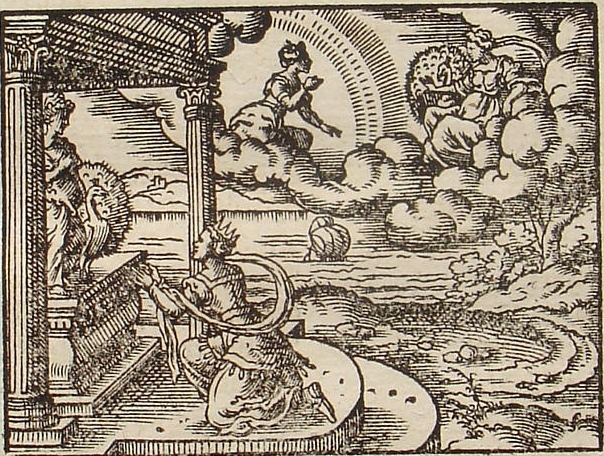 Alcyone and Ceyx, son of the Morning Star, and king of Trachis are ecstatically happily married, and according to Pseudo-Apollodorus’s account, often sacrilegiously call each other “Zeus” and “Hera.” This angers Zeus, so while Ceyx is at sea (going to consult an oracle according to Ovid’s account), Zeus throws a thunderbolt at his ship. Soon after, Morpheus (god of dreams), disguised as Ceyx, appears to Alcyone as an apparition to tell her of his fate, and she throws herself into the sea in her grief. 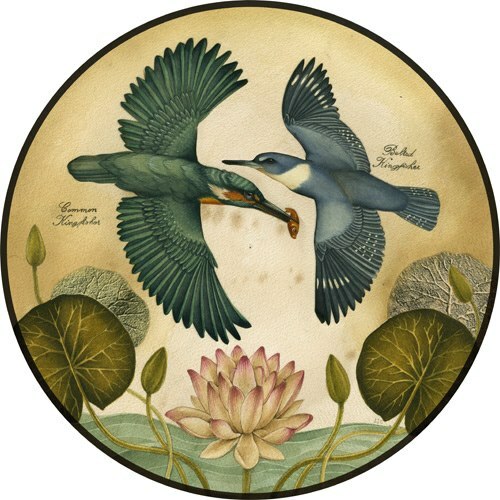 Out of compassion, the gods change them both into halcyon birds (kingfishers), named after her. Ovid and Hyginus both recount the metamorphosis of the pair after Ceyx’s loss in a terrible storm, though they both omit Ceyx and Alcyone calling each other Zeus and Hera (and Zeus’s resulting anger) as a reason for the storm. 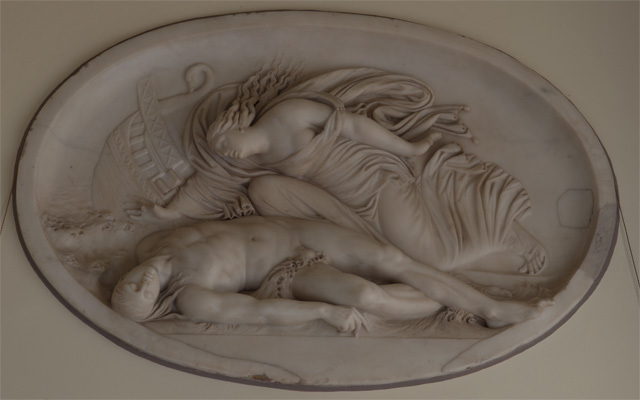 Ovid also adds the detail of her seeing his body washed up on shore before her attempted suicide. Ovid and Hyginus both make the metamorphosis the origin of the etymology for “halcyon days” the period in winter when storms never occur. They state that these were originally the 14 days each year (seven days on either side of the shortest day of the year) during which Alcyone (as a kingfisher) lays her eggs and makes her nest on the sea. Her father Aeolus, god of the winds, restrains the winds and calms the waves so she can hatch her chicks in safety. The phrase has since come to refer to any peaceful time (usually in hindsight). At one time “halcyon days” also referred to a lucky break, or a bright interval set in the midst of adversity, just as the days of calm and mild weather are set in the height of winter for the sake of the kingfishers. Think of the halcyon days as parallel with Indian summer. Halcyon is now used as a genus name for certain types of kingfisher. There are 11 species in the genus. It is far from clear what bird the classical Greek word ʼαλκυων is referring to, but modern translators normally equate it with the kingfisher. 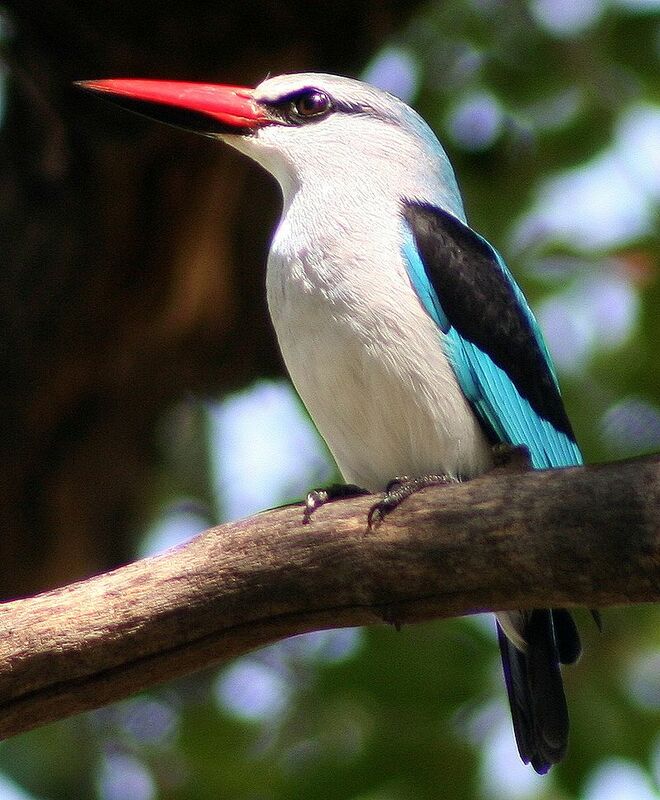 Hence English naturalist and artist William John Swainson coined the name for a genus in 1821 for the purpose of assigned a scientific name to a species of woodland kingfisher (Halcyon senegalensis). Whisk the flour and water in a mixing bowl to form a thick paste. Add the extra virgin olive oil and salt to taste, and whisk again. Let rest for about 30 minutes. Heat a heavy skillet over medium heat and add a small amount of olive oil. Pour in 2 tablespoonsful of batter at a time to form small cakes. They will spread at the outset, so do not crowd them. When they are cooked and mottled brown on the underside, turn them with a spatula and cook them on the other side. When cooked keep them warm while you make more. Serve warm with honey. You could also sprinkle them with chopped figs. On this date in 1902, archaeologist Valerios Stais found among some pieces of rock that had been retrieved from the Antikythera shipwreck in Greece 2 years earlier, one piece of rock that had a gear wheel embedded in it. Stais initially believed it was an astronomical clock, but most scholars at the time considered the device to be an anachronism of some sort, too complex to have been constructed during the same period as the other pieces that had been discovered with it (dated around the 1st and 2nd centuries BCE). Nope !! 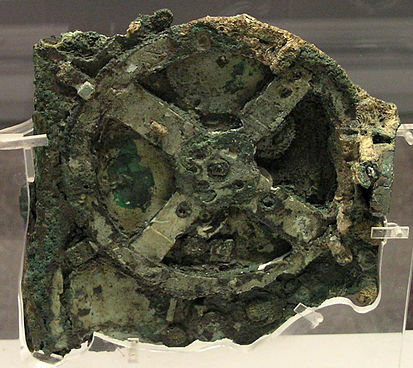 What is now called the Antikythera mechanism is, in fact, an ancient Greek analogue computer and orrery used to predict astronomical positions and eclipses for calendrical and astrological purposes, as well as a four-year cycle of athletic games that was similar, but not identical, to an Olympiad, the cycle of the ancient Olympic Games. Nothing like it would re-emerge in Europe for 15 centuries. There is so much about the ancient world that remains a mystery (Stonehenge, the Pyramids, etc.). 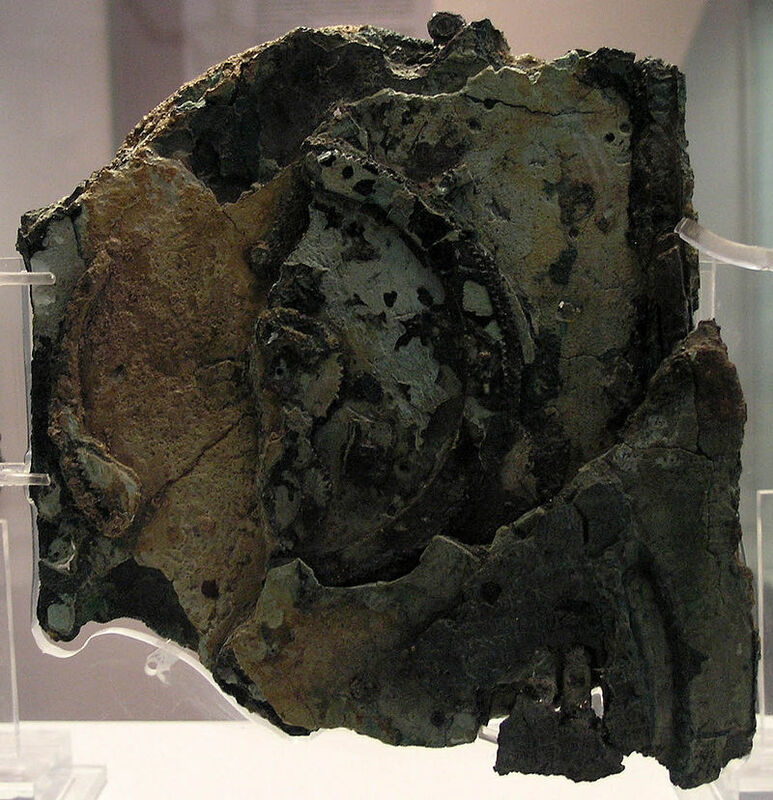 The Antikythera mechanism was found to be housed in a 340 mm (13 in) × 180 mm (7.1 in) × 90 mm (3.5 in) wooden box but full analysis of its form and uses has only recently been fully performed. In fact after Stais discovered it, it was ignored for 50 years, but then gradually scientists of various stripes, including historians of science, looked into it, and research into the mechanism is ongoing. Derek J. de Solla Price of Yale became interested in it in 1951, and in 1971, both Price and Greek nuclear physicist Charalampos Karakalos made X-ray and gamma-ray images of the 82 fragments. The mechanism is clearly a complex clockwork device composed of at least 30 meshing bronze gears. Using modern computer x-ray tomography and high resolution surface scanning, a team led by Mike Edmunds and Tony Freeth at Cardiff University were able to look inside fragments of the crust-encased mechanism and read the faintest inscriptions that once covered the outer casing of the machine. Detailed imaging of the mechanism suggests it dates back to around 150-100 BCE and had 37 gear wheels enabling it to follow the movements of the moon and the sun through the zodiac, predict eclipses and even recreate the irregular orbit of the moon. The motion, known as the first lunar anomaly, was first described by the astronomer Hipparchus of Rhodes in the 2nd century BCE, and so it’s possible that he was consulted in the machine’s construction. Its remains were found as one lump later separated into three main fragments, which are now divided into 82 separate fragments after conservation work. Four of these fragments contain gears, while inscriptions are found on many others. The largest gear is approximately 140 mm (5.5 in) in diameter and originally had 224 teeth. It is not known how the mechanism came to be on the sunken cargo ship, but it has been suggested that it was being taken from Rhodes to Rome, together with other looted treasure, to support a triumphal parade being staged by Julius Caesar. 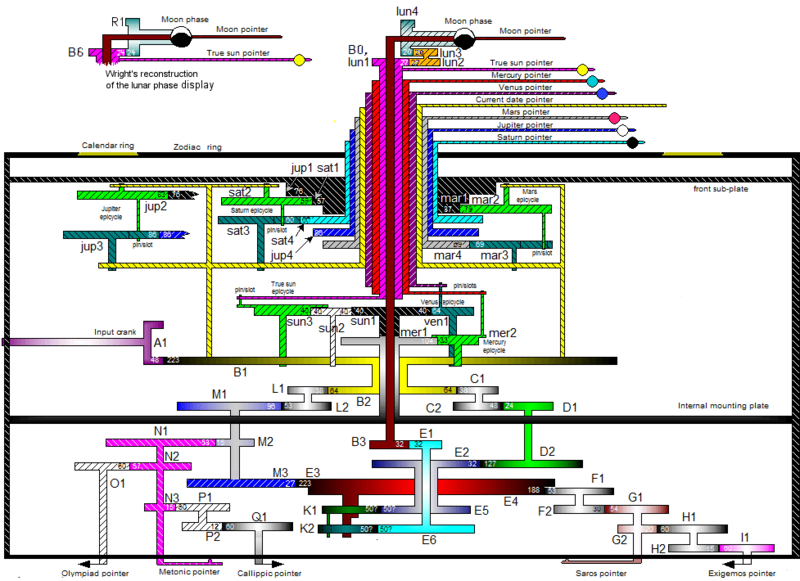 The mechanism is not generally referred to as the first known analogue computer, and the quality and complexity of the mechanism’s manufacture suggests it has undiscovered predecessors made during the Hellenistic period. 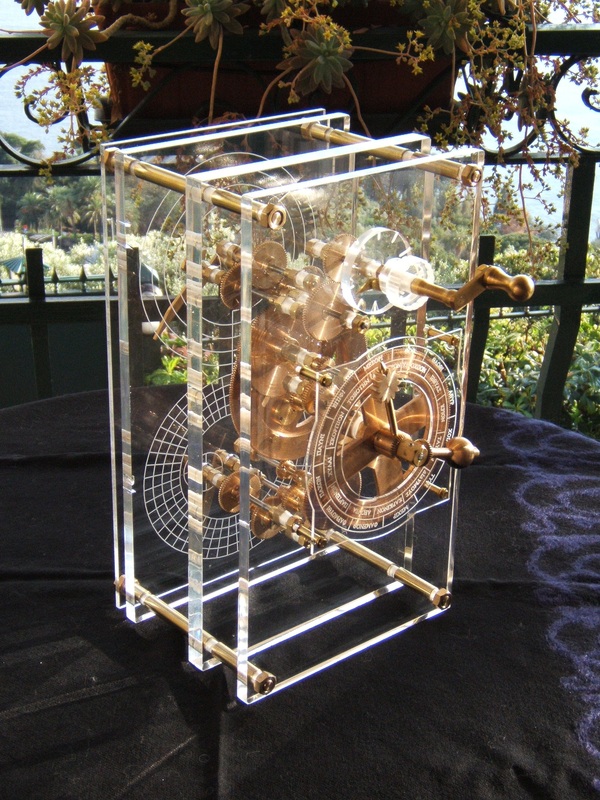 In 1974, Price concluded from the gear settings and inscriptions on the mechanism’s faces that it was made about 87 BCE and lost only a few years later. Jacques Cousteau and associates visited the wreck in 1976 and recovered coins dated to between 76 and 67 BCE. Though its advanced state of corrosion has made it impossible to perform an accurate compositional analysis, it is believed the device was made of a low-tin bronze alloy (of approximately 95% copper, 5% tin). All its instructions are written in Koine Greek, and the consensus among scholars is that the mechanism was made in the Greek-speaking world. 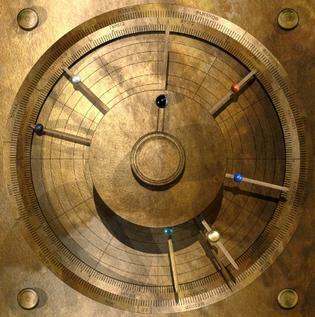 In 2008, continued research by the Antikythera Mechanism Research Project suggested the concept for the mechanism may have originated in the colonies of Corinth, since they identified the calendar on the Metonic Spiral as coming from Corinth or one of its colonies in Northwest Greece or Sicily. Syracuse was a colony of Corinth and the home of Archimedes, which, so the Antikythera Mechanism Research project argued in 2008, might imply a connection with the school of Archimedes. But the ship carrying the device also contained vases in the style common in Rhodes of the time, leading to a hypothesis that the device was constructed at an academy founded by the Stoic philosopher Posidonius on that island. Rhodes was busy trading port in antiquity, and also a center of astronomy and mechanical engineering, home to the astronomer Hipparchus, active from about 140 BCE to 120 BCE. That the mechanism uses Hipparchus’s theory for the motion of the moon suggests the possibility he may have designed, or at least worked on it. Finally, the Rhodian hypothesis gains further support by the recent decipherment of text on the dial referring to the dating (every 4 years) of the relatively minor Halieia games of Rhodesl. 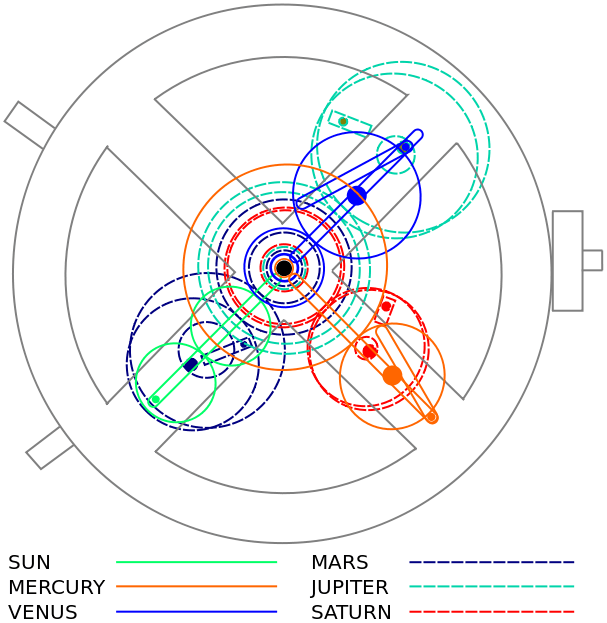 In addition, it has recently been argued that the astronomical events on the parapegma (almanac plate) of the Antikythera Mechanism work best for latitudes in the range of 33.3-37.0 degrees north. Rhodes is located between the latitudes of 35.5 and 36.25 degrees north. Using analysis of existing fragments various attempts have been made on paper, and in metal, to reconstruct a working model of the mechanism. 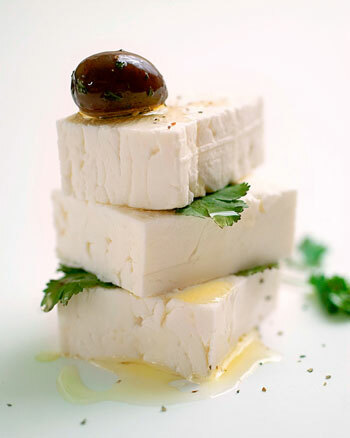 Some of the earliest Greek recipes extant mention the use of cheese. In book 9 of Homer’s Odyssey, Odysseus meets the Cyclops Polyphemus in cave who, on returning with his sheep and goats from the fields, milks them and makes cheese with the milk. Feta is made from sheep’s milk or a mix of sheep’s and goat’s milk, so some food historians conjecture that feta or something akin may date from the 8th century BCE (Homer’s era). One of the oldest Greek recipes, although hard to interpret accurately, calls for fish baked with cheese and herbs. I don’t have the necessary ingredients to hand to experiment at the moment, and recipes for baked or fried fish and feta that I have available, all call for New World ingredients such as tomatoes and zucchini. 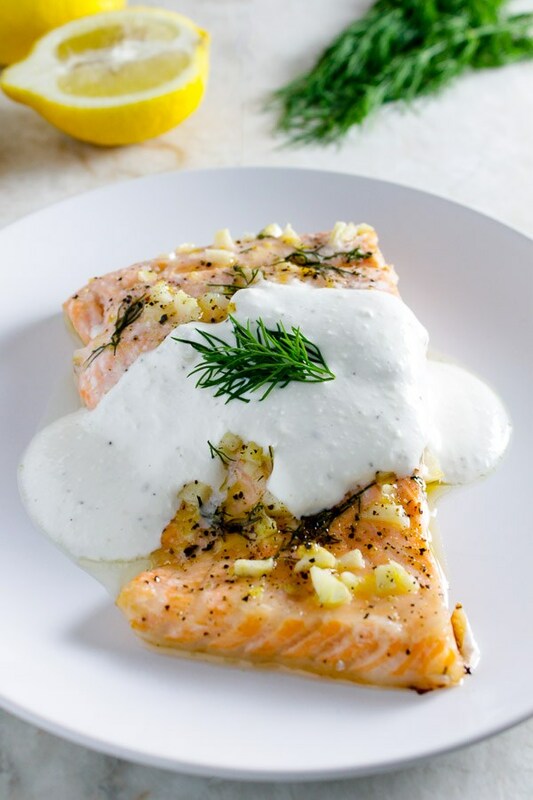 My suggestion would be to coat a roasting pan with olive oil, lay in some Mediterranean fish fillets, and top them with crumbled feta mixed with either yoghurt or breadcrumbs seasoned with dill, salt and pepper. Garlic and onions would make good seasonings as well. 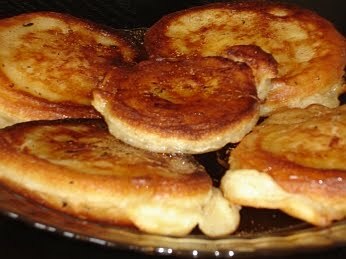 Bake at 375˚F for 20 to 25 minutes and serve with boiled potatoes and a green salad. 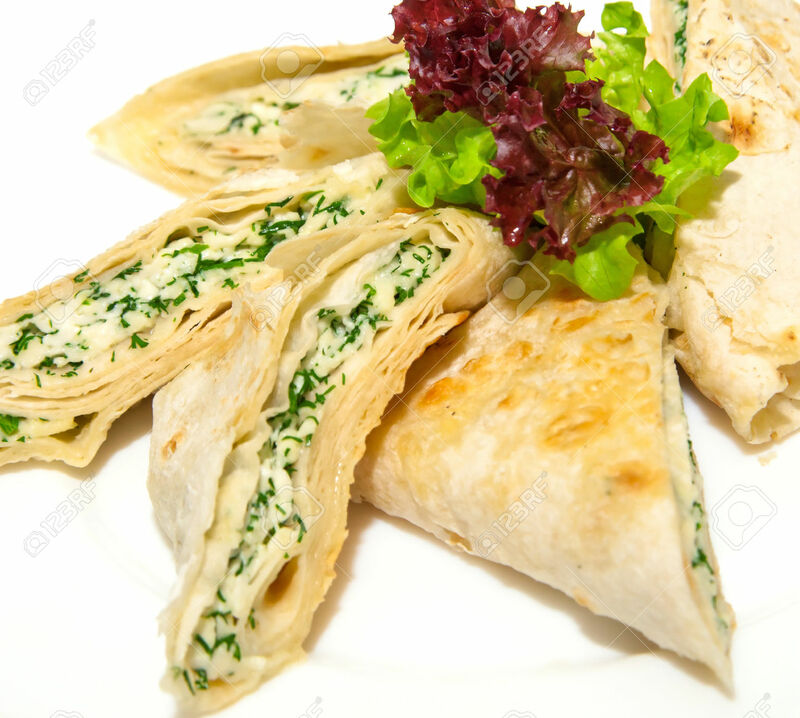 If you don’t want to be quite so adventurous, fill halved pitas with a mix of feta, chives and herbs, drizzle with olive oil, and grill briefly until the pitas are golden and the feta is soft.